This is a little different to what I usually share on this blog, but I thought this might be useful for some. 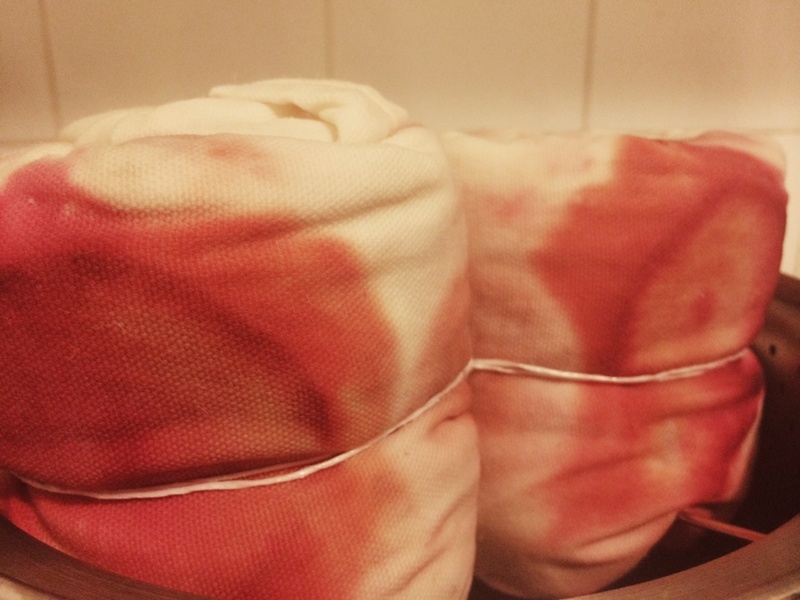 I came across an article about natural dye, and dyeing fabric by ‘hammering’ rose petals and beetroot into the fibres, and the results looked good. 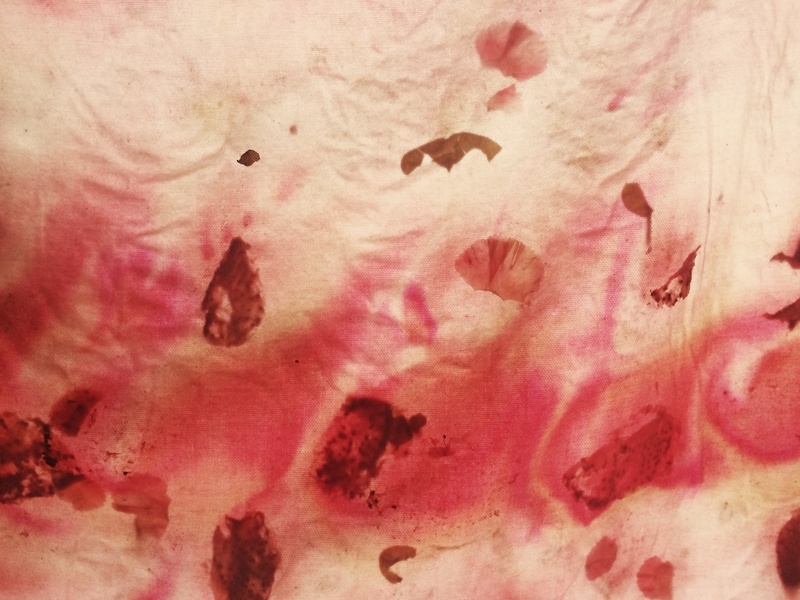 I also had a tablecloth that was covered in ‘natural’ wine and pen stains, so I decided to experiment with the natural dye in food, which seemed a bit more fun than buy it in bottles off the shelf. 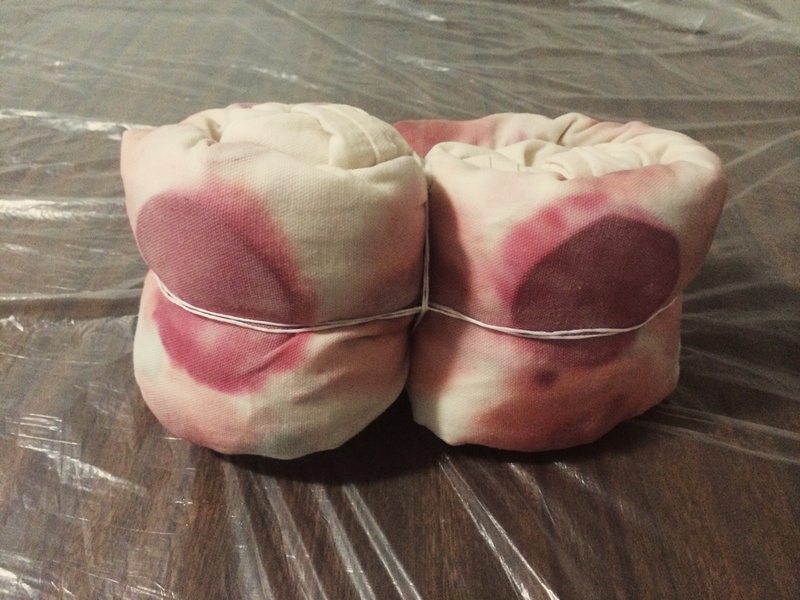 This is the tablecloth, rolled into a ball, and placed in a solution of water and white vinegar (four parts water and one part vinegar), and on stove for an hour. First bring to boil, then turn back to low heat; cover. When an hour is up, take off heat and let it cool. Then hand-wring as much of the vinegar solution as you can. As I was working with a large piece of fabric, I needed a large surface, so the dining table it was. As the fabric was wet, I used a sheet of plastic to protect the surface. You can get these at a hardware store for a couple of dollars — look in the paint section (it is the sheets normally used to protect floors). 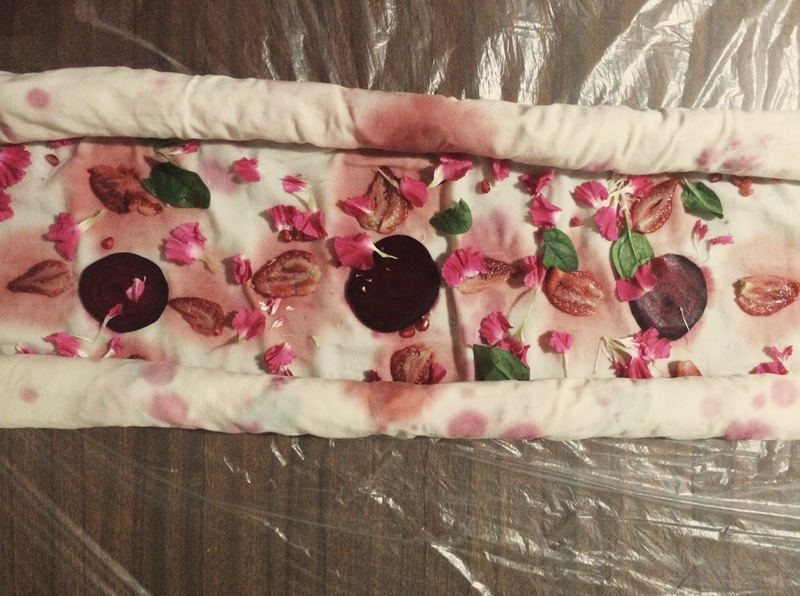 The food is placed on the fabric. I decided to go with pinks beetroot, strawberries, pomegranate seeds, pink carnation petals, and some baby spinach. Initially it was put in to a form of design that planned to squash/smash the food, and have the dye run, forming larger patterns of dye. 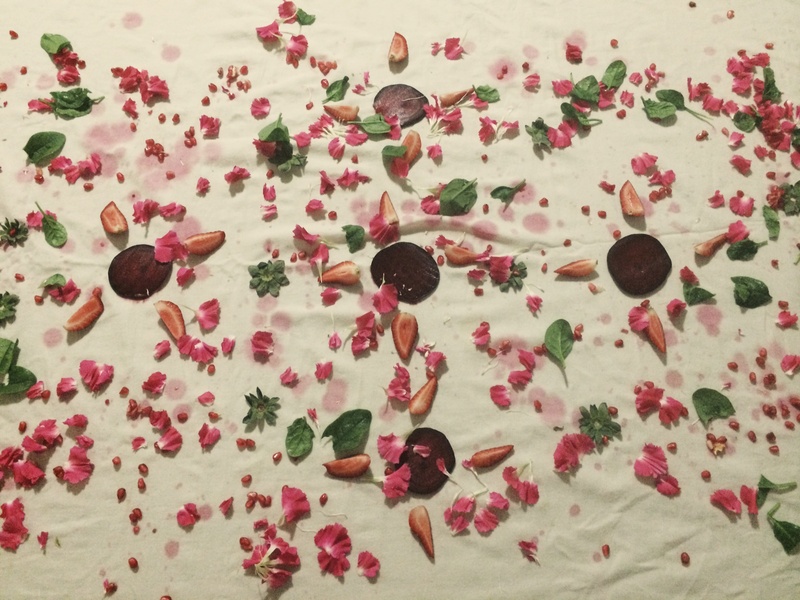 Pomegranate seeds are shaken and spread over. Bright pink carnation petals are added. Roses would have been preferred, but as I don’t have my own, buying some seemed too expensive; carnations it would be). Slowly, tightly role the fabric (this took some care near the firm beetroot as it didn’t ‘roll’ as easy as the rest). If you have a smaller piece of fabric, you might find it easier to start the rolling with a large stick, or piece of dowel. Looking like a fancy pizza at this point. 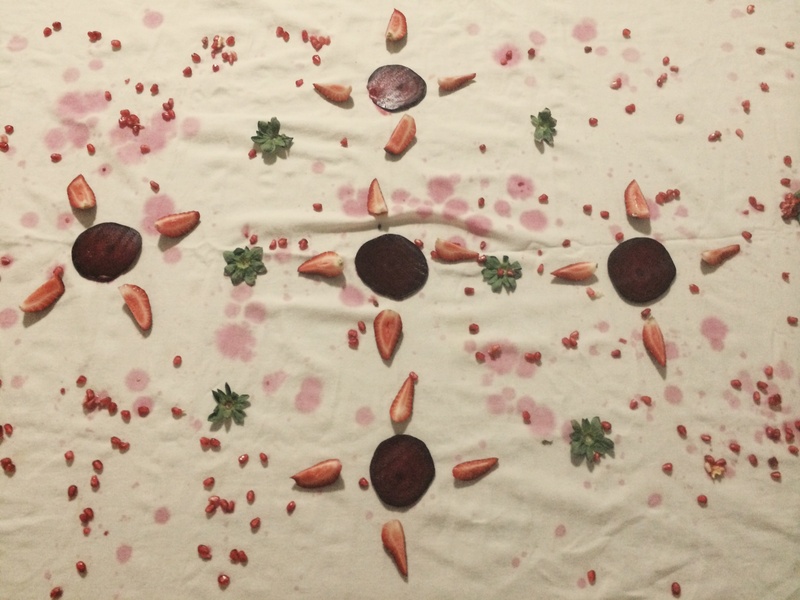 I wanted even coverage of the dye across the tablecloth, so the fabric was rolled from each end, rather than one end end up up ‘further away’ from all the dye at the centre. The tablecloth bundled tight, and tied with string (but not tied too tight as I didn’t want ‘tie-dye’ lines showing too much). The bundle is read to steam. 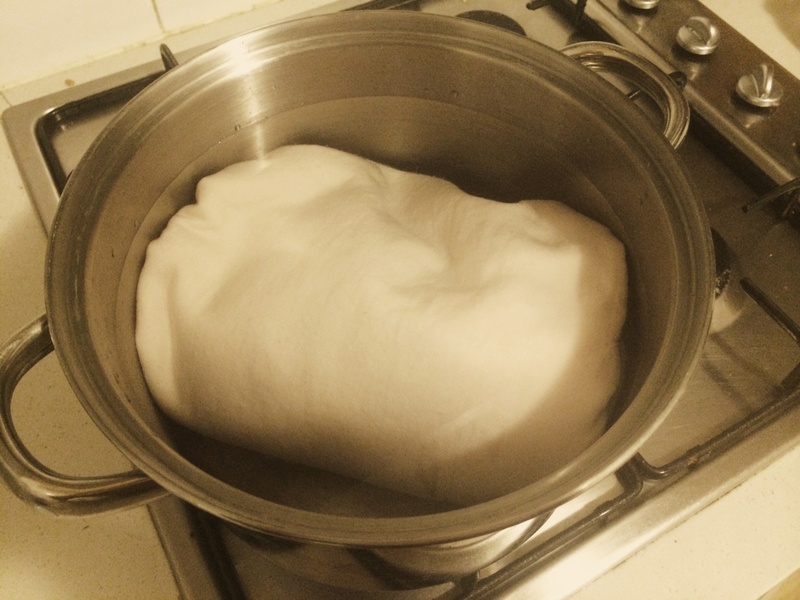 Make sure you steam, rather than boil, because if any of the fabric gets in the water it might all run. The bundle was too big for the lid to fit easily, so was covered in a sheet of foil. After 45 minutes I of steaming. 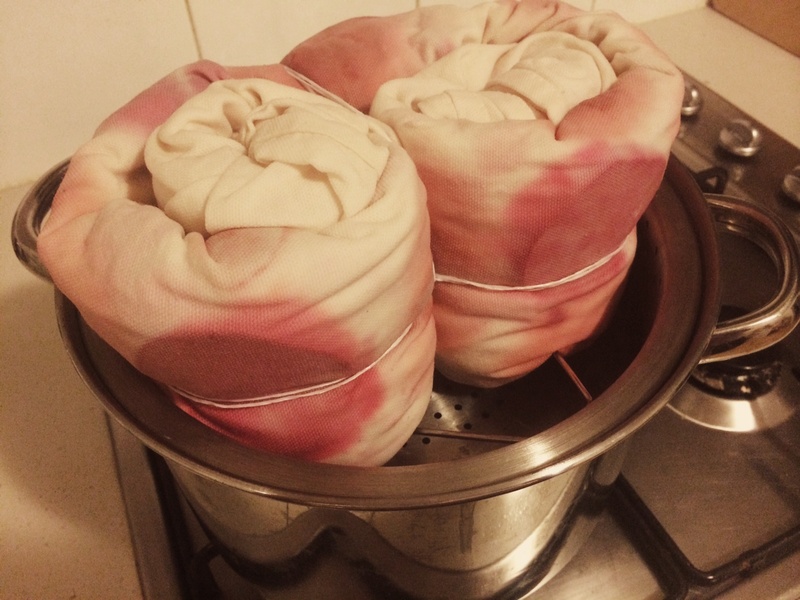 I then turned the bundle over and steamed for another 45 minutes (covered). 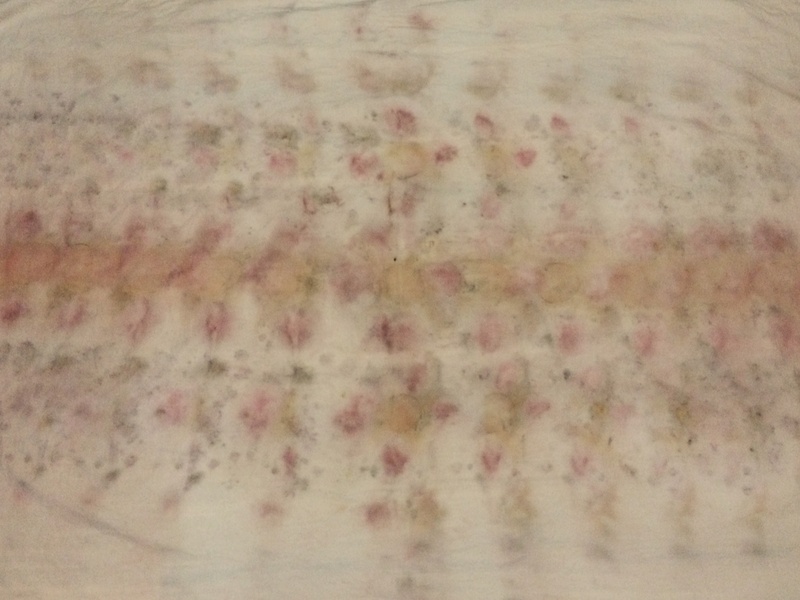 The bundle was then removed from the steam, and placed on the foil to cool for an hour, then was wrapped in a plastic bag overnight (12 hours in total), to let the colour stain. If you have a garden or compost, that is the ideal place to shake-out the petals, fruit or vegetables. I am in an apartment, so the best option was to line the bath with plastic food wrap (‘Glad Wrap’), and shake-out the food this way. 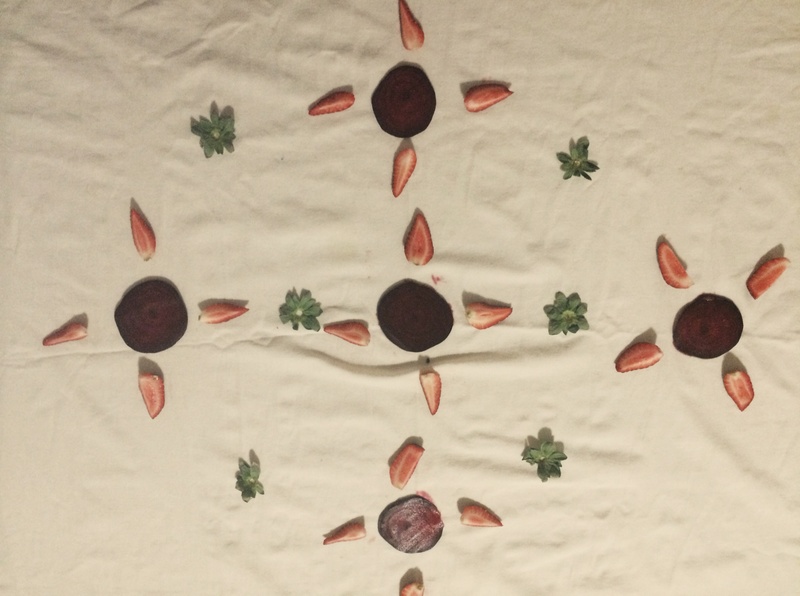 The beetroot left the strongest dye, with the pomegranate, strawberries, petals a softer result. 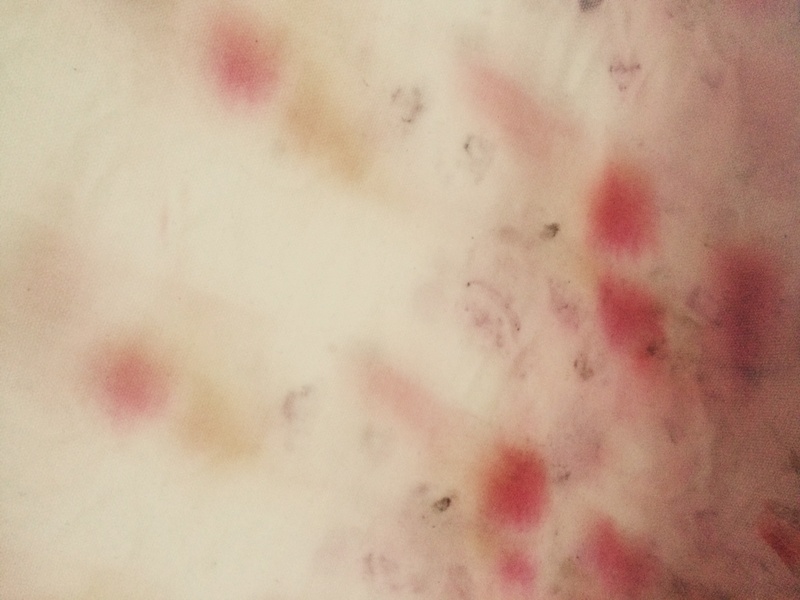 By letting the fabric dry before washing, the stain can hopefully ‘set’ some more. 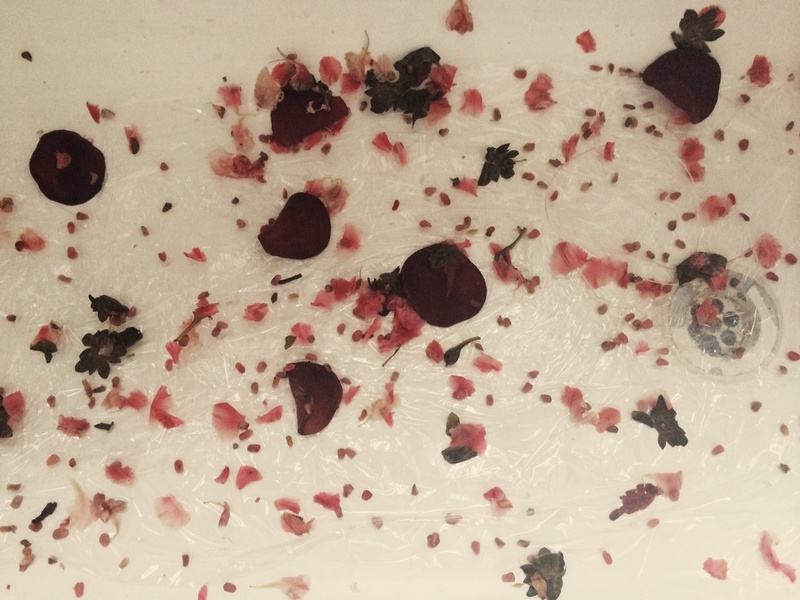 (The bathroom did smell like pickled beetroot at this point). 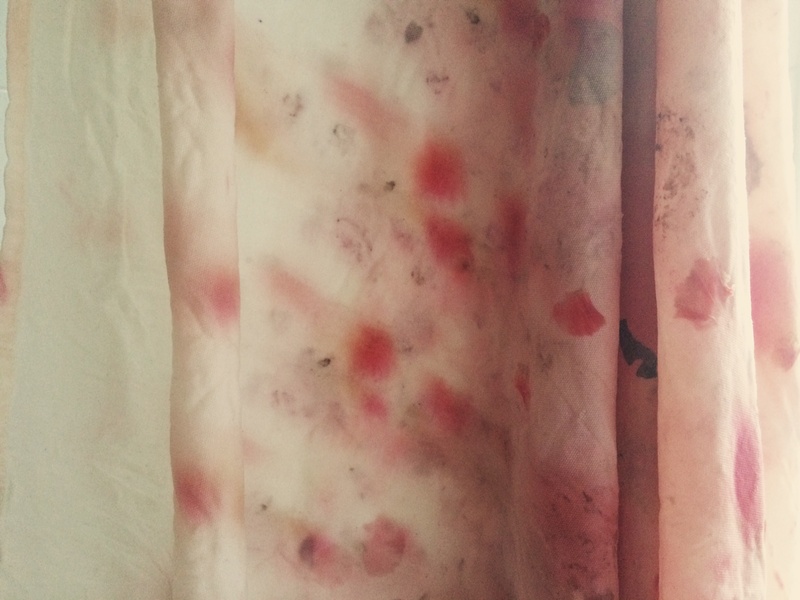 The colours have faded back, and the bright beetroot colours have gone ‘apricot’, and the strawberry dye has retained the strongest pink (which is different to what I predicted). The spinach hasn’t gone green, but it has given it some dye. It is a bit hard to get this photo to match the exact ‘real life’ colour, but it is close. The result feels like I’ve discovered an antique treasure. 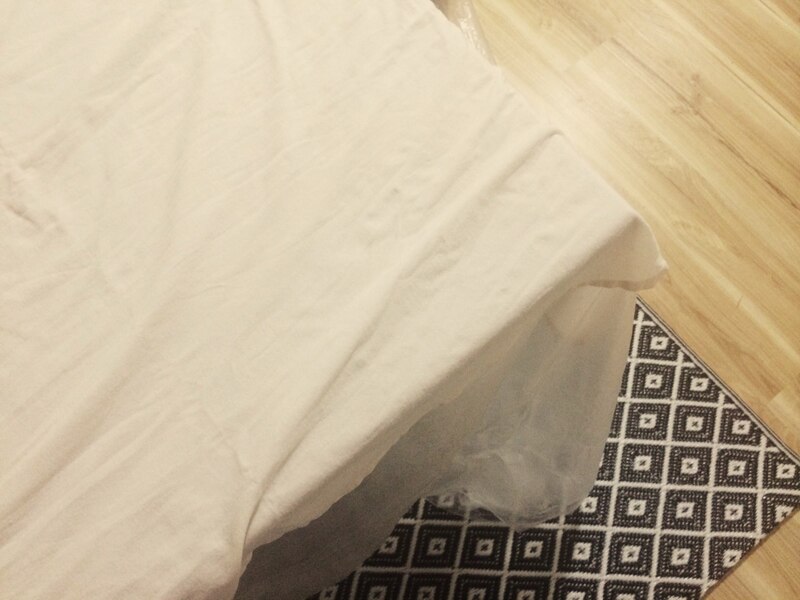 Start with something small — a handkerchief, pillow case, cushion cover, tea-towel, spare fabric. Choose a lighter ‘base’ fabric for best effect (but other colours will create interesting contrasts too). 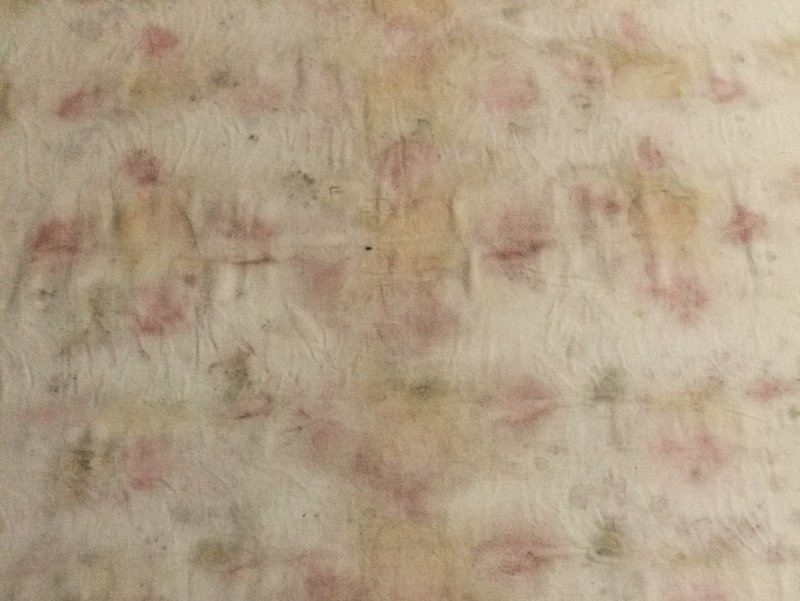 My tablecloth was cream-coloured. Make sure you have a large pot for boiling; then steaming; and plastic to protect bench/tabletops if you don’t have an outdoor area. Softer fruit is more juicy, and easier to ‘hammer’ and squash (if you want to try that technique). To dye just one colour, most fruit/vegetable options can be boiled in a pot first to get the colour out i.e. 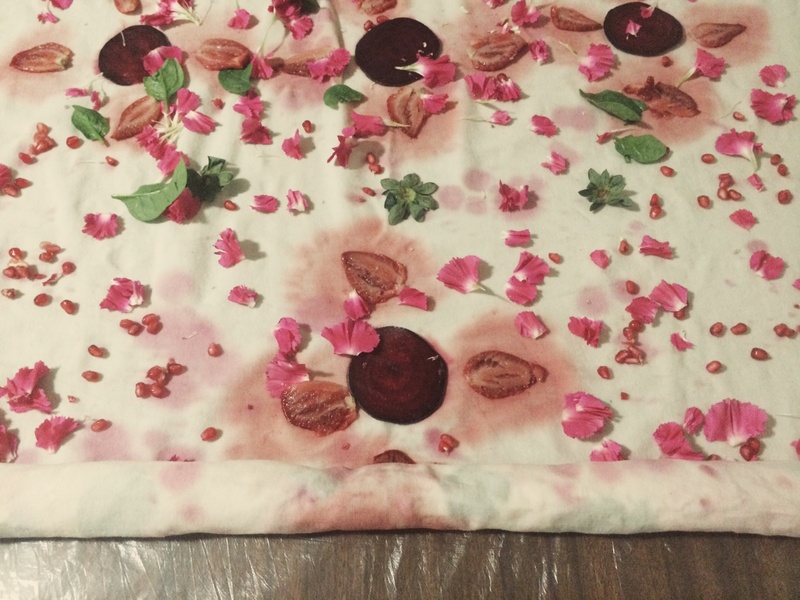 just beetroot for pink, and then boil fabric in the natural dye. Make sure the fabric is natural — cotton or silk works best. If you want to try yourself, some of the natural ingredients that can create your colours are: Yellows — onion skins, pumpkin husks, turmeric, saffron, celery leaves; Browns — walnut shells, coffee, tea; Pinks — strawberries, rose petals, beetroot, lavender, red cabbage (avocado skins for a paler more vintage pink); Blacks — blackberries; Blues — red cabbage with a spray of water/baking powder (you can find more food/colour combinations from a web search. There are lots of websites about that explain the combinations of e.g. alum and plants that can be used to achieve different colours. Have room air-freshener, a scented candle, or oil burner on hand to counter the vinegar aroma that will fill the house, if using the same method that I did. It is important for me to mention that while doing this, I did at time feel a bit wasteful and indulgent to use food that was obviously intended for eating. So think carefully about what food you want to use, and the fabric you will use, so it doesn’t go to waste. Doing this has given me lots of ideas for other dyeing experiments (with smaller pieces of fabric) and I’ll add them this page as I do them. I encourage you to give it a try too. This is so cute! Getting creative on your holidays!